TOMS RIVER, N.J. (WPVI) -- Two massive drug investigations resulted in charges for more than 30 people, the Ocean County prosecutor announced on Wednesday. The two drug networks, dubbed "Operation Sin City" and "Operation Broken Rule" were responsible for bringing more than a kilogram of heroin into Ocean County every week, prosecutor Joseph Coronato said. Each kilogram is equal to 50,000 doses. The drug network was operating not only in Ocean County, but in Union, Monmouth and Atlantic counties along with Philadelphia. Jonathan Gonzales, 32, (a.k.a. 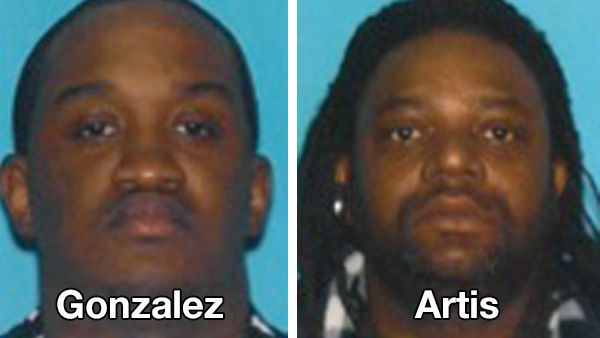 "Sin") with addresses in Pleasantville and Toms River, is accused of being the ringleader in the "Sin City" case. Meanwhile, Betrick Artis, 45, (a.k.a "King Rule") of Lakewood and his son, Ashzon, 25, are accused of being the ringleaders of the "Broken Rule" case. In all, investigators say they seized 31,000 individual doses of heroin, 25 grams of raw heroin, $140,000 in cash, 14 cars - including one equipped to hide drugs - and six guns.